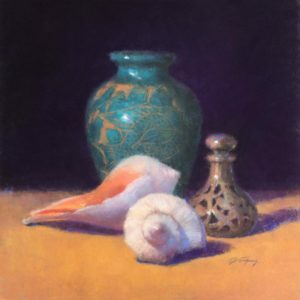 Still lifes are much more than a collection of objects. A story can be told by the selected subjects and the space they occupy. Establishing a mood supports this narrative. In this workshop, we will study how to create the illusion of depth and atmosphere while learning the importance of values, form, edges and color. We will also explore the technical aspects of setting up a still life, lighting concerns, tips for accurate drawing, and guidelines for interesting compositions. Students will receive plenty of individualized instruction to help them reach their personal goals. Prior drawing and painting experience will be useful, but all levels are encouraged to participate in this workshop. Although demos will be in pastel, oil painters are also welcome as many of the concepts are common both media.